To fulfill the needs of our clients, we are engaged in manufacturing, supplying and distributing a wide range of PC Add Ons. These PC Add Ons are sturdily built and offer reliable performance. By capitalizing the skills and talent of our professionals, we are providing a huge assortment of PCI DIOT Card. 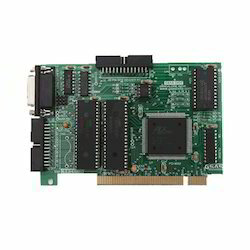 PCI DIOT Card is basically a Digital I/O Card that is ideal to use for instrumentation and control, where the digital data from instruments such as DPMs and frequency counters is to be collected by a PC. Also, offered product is effective to use for observing the status of the digital signals from various sources. Moreover, our product can also be used for event counting and pulse width measuring. The output from these products can be used to observe and control actuate external devices such as relays, stepper motors, LEDs and many more. One can insert these products in any one of the free expansion PCI BUS slots of the PC.